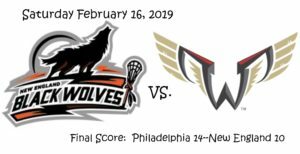 The first matchup between the Philadelphia Wings (2-7) and New England Black Wolves (4-4) was all it was hyped up to be. 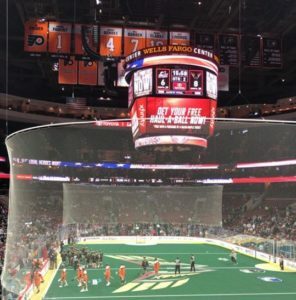 The Philadelphia fans will never forget when the franchise that they supported for so long picked up and moved to Connecticut to become the Black Wolves. As expansion franchises usually do, the new Wings have been struggling this season. If this was the first game of theirs you watched this season, you couldn’t tell. Philadelphia put together a complete game to get their second win of the season against the “old” Wings. The game was physical, with a total of 34 penalty minutes (12 for Philadelphia, 22 for New England). But there were also highlight goals, great goaltending and a dedicated fan base 10,614 strong cheering the home team on. Final Score: New England-10, Philadelphia-14. Philadelphia came out of the gates and scored the first two goals to take an early lead that they never let up. 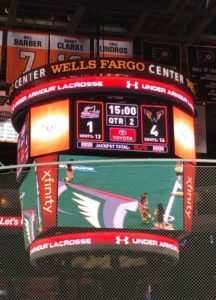 Just 1:32 in, Matt Rambo (3G) scored his first of the night, and at 3:55 Jordan Hall (1G, 5A) snuck through the New England defense for another quick goal. A penalty on Ryan Fournier gave the Wings a chance to get even further ahead, but two penalties on Philadelphia in the next minute of play turned it into a four on three, man down situation. 20 seconds into the man advantage, New England finally got on the board when Stephan Leblanc (3G, 4A) fired a laser from the top middle. The good fortune was short lived. Kevin Crowley (4G), playing in his first game against New England since being traded, scored 31 seconds later from way outside. Before the quarter ended, Vaughn Harris (1G, 1A) increased the lead to three goals after a beautiful assist from Hall. At the end of the first quarter, Philadelphia led New England 4-1. The Black Wolves flipped the script and came out hot in the second quarter. Leblanc scored his second of the night just 45 seconds in and Dereck Downs (3G) cut the deficit to just one 4:39 in. Again though, Crowley answered quickly, scoring just 21 seconds later. Rambo followed it up with his second 31 seconds after. Continuing the quick exchange, Callum Crawford (1G, 5A) found the net under a minute after that and with 8:31 remaining in the half the score was now 6-4. A New England penalty opened the door for Crowley to complete his first half hat trick and with 6:20 remaining, Steph Charbonneau (1G, 1A) increased the lead to four with a shorthanded goal. In the last five minutes of play, New England would score twice. Tyler Digby (1G, 4A) scored with 4:04 remaining, and Kevin Buchanan (1G, 1A) playing in his first game of the season, scored with 2:05 left. At the half, Philadelphia led New England 8-6. New England got within one 35 seconds into the third when Leblanc scored his hat trick goal. As he had all game though, Crowley quickly answered scoring just 32 seconds later. At this point, the game started to get chippy. Despite the 12 minutes of penalties served in the quarter though, neither team would score on the power play. There were two more even strength goals though. Rambo completed his hat trick 7:23 in and with 4:38 remaining Downs answered to again get the Black Wolves within two. At the end of the third quarter, Philadelphia led New England 10-8. Both teams play this afternoon in New England at 3:00 PM EST.